Are you looking for a proper Response Letter to Unsuccessful subscribers and customers, that is according to the GDPR directive? Check out this response letter sample now. Several upcoming Data protection laws are nowadays demanding improved communication and actions from companies. For example, the GDPR directive requires proper data management from companies that process data of European citizens. This policy directive was adopted because Europeans demand the same data protection rights across the EU and regardless of where their data is processed. It aims to make Europe fit for the digital age. We provide a perfect example letter with reference to data protection laws and in order to help you to comply with the local application data protection laws and regulations. This letter is applicable to the situation a customer decides to not cooperate with you, but already provided sensitive data to you, such as passport details or bank details. In this situation it's important to make sure you will adequately remove the data received in the future. 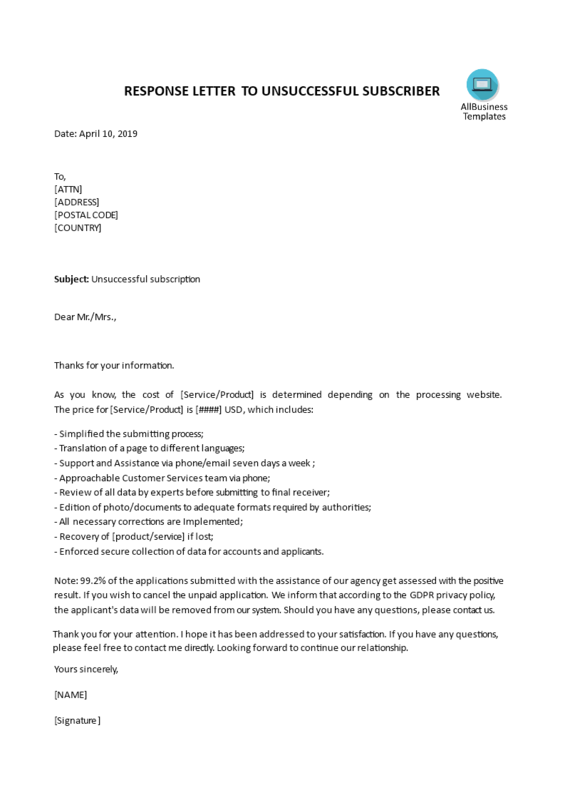 Download this Response Letter to Unsuccessful subscriber now, and also check out our fit-for-purpose GDPR Complete Compliance Kit templates here!